Today was my mother’s funeral. The service was at Brigadier General William C. Doyle Veterans Memorial Cemetery, Wrightstown, NJ, where she will be buried alongside my father. It was a very cold, crisp day but sunny. Here is the eulogy I spoke at the service. My mother was an artist. Unfortunately, she was born into a time and a family where being an artist was a luxury that a girl couldn’t afford. The time was the Great Depression and the family was ruled by my grandmother Bertha Littman. When Mom was a young girl, getting a new dress that cost a whole 5 dollars was a major expense and she felt grateful that her parents bought it for her. WWII was just ending when my mother was about to graduate from High School. She considered the possibility of going on to Cooper Union, an art college in New York City that you didn’t have to pay for. But you had to take a test and you had to have a portfolio to show in order to get in. And you had to believe in yourself. But if you had a mother who believed that the only thing a girl should do was get married, then what was the point of going to College? So, being the good girl who listened to her mother, my mom got a job right after high school and packed away any dreams she had of art school. She went to work as a secretary for the Navy department and continued to live at home, contributing to the family budget with her salary. But a fellow co-worker suggested they run off and enlist in the Navy, in the women’s division known as WAVES (Women Accepted for Volunteer Emergency Service). She considered it but she had just met my dad and she had my grandmother breathing down her neck with so? so? So instead of going off to see the world she got married and settled down in Jersey City, New Jersey. 7 years later the family moved to Budd Lake in Northern Jersey and there, my mom stayed for the next 34 years. She wasnt idle during those years: she worked full time. She raised 2 kids. She was very active in Temple Shalom, the Reform Synagogue which my parents helped form, several times holding the post of president of the Sisterhood and working hard to raise money to erect a building to house the new congregation. But she never really forgot the art thing. When I went off to Pratt to study art I think, in a way, I fulfilled the dream she once had for herself. But she used her visual creativity in other ways. She, with my dad’s help, totally transformed the house in Budd Lake after we kids moved out. She used materials in unusual ways. I remember back in the 60s helping her hang wallpaper on the ceiling of our dining room. What a job that was – so unusual and it looked great. She hung exterior wall lamps on a textured, bright red living room wall creating an exciting focal point. She had my dad put up ceramic tile on counter tops in the dining room. Each piece of furniture she chose was different but everything blended together to make a beautiful unified whole. She did the same thing when she and my dad moved to their new home in Homestead. She had the ideas and my dad with his meticulous craftsmanship made it happen. I think she could have been a very successful interior designer in a different life. I think of her and the generations that have gone before her. Our generations overlap. They are like a part of a revolving relay race through time. Each generation handing on the baton to the next. There on the track ahead of me has been my mom. She had the baton. She got it from her mother. I see mom coming around the bend. I enter the track, jogging towards the hand-off zone. We both run together for awhile until finally, the time is right and Mom hands the baton off to me. I’m off! Running my race through Art School, then life in New York City, then the really big curve – moving to Stockholm. Mom, of course, doesn’t stop running immediately after the hand-off. She keeps on going, slowing down gently, but still running along, until she slows down to stand on the sidelines cheering me on as I run my race. But now my mom is gone. Her race is done. My mother loved ice cream. She loved potatos. Mah Jongg was her life-long passion. I remember as a child falling asleep to the sound of the tiles being shuffled downstairs in the living room. She liked reading. She liked to write. She wasnt so interested in sitting and discussing the big questions of life that I often tried to engage her in. She would rather be doing things with people. At the end of her life she got to do something she really enjoyed. She edited the Monroe Village Residents newsletter for 18 months. In that she got to write, to fix other peoples articles, to layout the pages and to draw the covers. I remember way back in High school I had to read a novel called ”The Bridge of San Luis Rey” by Thornton Wilder. Now 40 some odd years later, I admit that I no longer remember any characters from the book or what even happened in it. But through all these years, the central theme of that novel has always remained with me: No one is truly dead and gone as long as there is still someone left who loves and remembers them. This entry was posted on Wednesday, January 4th, 2012 at 03:06and is filed under . You can follow any responses to this entry through the RSS 2.0 feed. You can leave a response, or trackback from your own site. That was a lovely eulogy, Hilarie. Evelyn would have been proud as she always was of you. She lives on through you now. I just read your eulogy. I never knew about your mom’s love for art. It’s sad that she didn’t get the chance growing up to live it, but so cool that she could live it through you! I do remember as a kid when Craig would tell us that it was “Mah Jongg Night”, and I knew your mom loved to play. Keep running with that baton, Bevin is waiting to run the next leg! Your words were truly beautiful! You gave us all a wonderful slice of your mom’s life! I’m sure she’s looking down on you with nothing but love and pride!! PS, Do you have some of the covers that she did for Monroe Village? I am deeply saddened to hear of your mothers passing. Linda and I were suspicious of something because our yearly exchange of holiday cards was not answered by your mom. Many of her dreams and aspirations apparently were lived through you and your mothers memory will always live in our hearts because of your eloquent eulogy. Much happiness and health in your future years. I am very sorry to hear of your mother’s passing. I last saw her before she moved from Bordentown, but kept in touch via email. Jim and I visited Evelyn and went to eat at Mastoris. 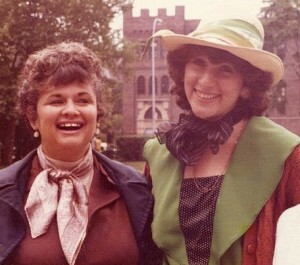 I think back to our parents and the Derwins visiting thru the years and their involvement in Temple Shalom. May Evelyn rest in peace.